The Monthly Mind Culture Magazine / Greater Minds, Finer Brains, Better Bodies, Practical Psychology, More Successful Lives, Teaching Men and Women How to Use Their Minds and How to Grow More Mental Power. Rochester, NY. Editor: Will J. Erwood, Florence Russell, Deane Erwood. 1/1, August 1927-August 1928. 32-36 pp., $2.00 a year. 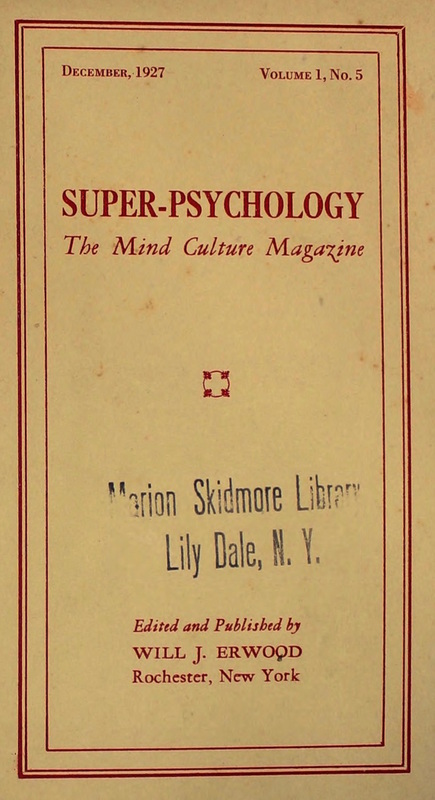 The journal was "dedicated to Greater Minds, Finer Brains, Better Bodies, Practical Psychology, More Successful Lives. Teaching Men and Women How to Use their Minds and How to Grow more Mental Power." Its proclaimed purpose was: "To Pluck A Doubt And Plant A Hope Wherever A Hope Will Grow; To Inspire Men and Women To Unfold Their Limitless Possibilities; And To Teach Them To Use The Mighty Powers Of The Mind Intelligently, Intentionally And Constructively, -- This Is The Purpose Of Super-Psychology And It Is To The Fulfillment Of This Ideal That We Dedicate This Magazine." Erwood (1874-1948) was a lifelong spiritualist and medium (he mediated "The Teacher") who easily moved into psychic development ("Radio-Centric Power" and practical psychology) as the spiritual market changed, emphasizing his psychological ideas as the "open sesame to the richest storehouse of nature thru the awakening of the dormant powers of the mind." The individual mind, in turn, was for Erwood, "a Manifestation of the Supreme Power Called God." He wrote the entire content of the journal (with the exception of the occasional poem by Ella Wheeler Wilcox), which seems to have been the text of his motivational speeches to his disciples. On Erwin and the transformation of his work into practical psychology, see the notes under Radiant Life and Mystic Key. Two issues in Skidmore Library, Lily Dale; LOC.